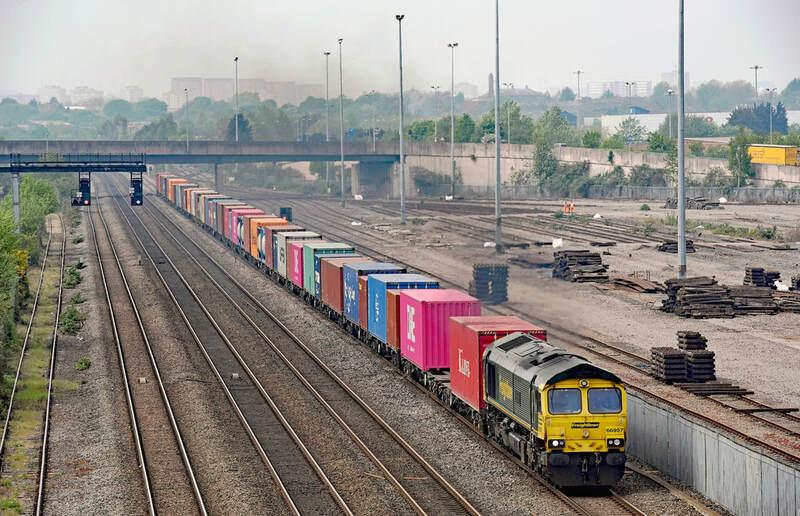 In early April 2019, track was removed and the stored wagons were taken away from the closd Washwood Heath yard in East Birmingham. The site is set to become a new rail-served Tarmac asphalt plant. On Wednesday 24 April 2019, Freightliner low-emission Class 66/9 No. 66957 Stephenson Locomotive Society 1909-2009 (the highest numbered member of the UK Class 66 fleet) heads a colourful rake of containers past the yard as the 12.12 (4L46) Lawley Street to London Gateway intermodal service.